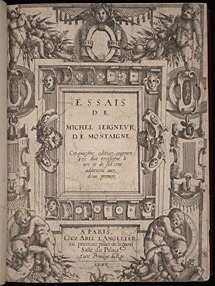 Les essais de Michel seigneur de Montaigne. Edition nouuelle, / trouuee après le deceds de l'autheur, reueuë & augmentée par luy d'vn tiers plus qu'aux precedentes impressions. Paris : Michel Sonnius, 1595. There is currently no print facsimile of this edition, so the University of Virginia Library is pleased to make the digital facsimile available to the public via The Renaissance in Print. Essais de Michel Seigneur de Montaigne. 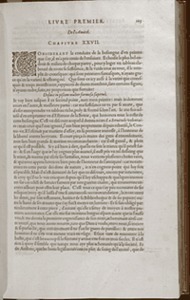 Cinquiesme edition, / augment'ee d'un troisiesme liure: et de six cens additions aux deux premiers. Paris : Abel L’Angelier, 1588. Learn more about the sixteenth-century editions of the Essais in the Gordon Collection. Que sçay-je? (“What do I know?”) was Montaigne’s motto, and he chose the image of the balance (scale) to represent his effort to weigh knowledge against his personal experience. The scale is in constant motion, and movement therefore characterizes his ongoing attempt to express the self, ondoyant et divers, in writing. Montaigne was the first to use the term “essay” to refer to a short discussion of a topic in prose. In Renaissance France, an essai indicated a “trial” or an “attempt”; the verb essayer meant apprendre, connaître par expérience, éprouver (to learn, to learn from experience, to try out or undergo). Montaigne intended to use this short prose form to try out, or weigh, his own views on life and to attempt to learn more about himself, while sharing his experiences with others in the process. Montaigne covers a wide range of topics, each of which is illustrated with anecdotes, proverbs, sayings and quotations from classical authors in his library. His essays interweave the philosophical and the personal, and each in some way conveys Montaigne’s own experience, often reflecting his desire to know and express the constantly changing self. Montaigne’s essays exhibit a rambling rather than a fixed formal style, choosing to follow the workings of the human mind rather than the traditional rules of rhetoric. In the search for answers to his central question, Que sçay-je?, Montaigne discovers that reason alone cannot bring him to the truth. Despite the limits of man’s reason, however, Montaigne ultimately expresses faith in the human condition and underscores the need to seek to know oneself, however difficult the journey. For Montaigne, happiness is only possible through personal experience and self-knowledge, by finding the balance between knowledge and living. Montaigne believed his search for self-knowledge was representative of the universal human condition. He chose to publish his Essais to serve as a reflection of the human condition, rather than to paint an ideal or exemplary figure. "Ie veux qu’on m’y voye en ma façon simple, naturelle & ordinaire, sans estude & artifice: car c’est moy que ie peins." 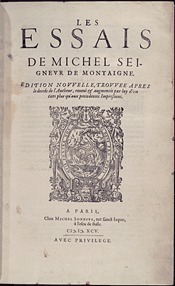 Montaigne’s Essais knew immediate success in France, following the publication of the first edition (2 volumes) in 1580. Click on the link below to read the text of contemporary accounts of Montaigne and his work in the Bibliothèques of Antoine du Verdier and La Croix du Maine, published after the first edition of the Essais, and before the second. Montaigne was born near Bordeaux, on the family property where he eventually wrote his Essais. As a young child, Montaigne’s first language was Latin, his father having hired a tutor with no knowledge of French. Montaigne attended the Collège de Guyenne in Bordeaux, then studied law. As a magistrate in Bordeaux, he met Etienne de la Boëtie, whose friendship (perfect, in Montaigne’s eyes) is the main topic of the essay on friendship, “De l’Amitié.” Montaigne married and had six children, only one of whom survived to adulthood. In 1571, Montaigne left behind his active legal career and retreated to the calm of the Château de Montaigne. Retiring to his tower, he wished to spend the rest of his life reading and writing his life’s thoughts and experiences. He kept largely to that plan, but did embark on a journey to Italy in 1580 to 1581. He kept a detailed journal of his travels to Italy, which was not published until 1774 (Gordon 1774 .M65). He also returned to serve as Mayor of Bordeaux from 1581 to 1585. Other than those forays back into the world, Montaigne remained at home and devoted himself to his project of writing the self. In chapter 30 of the first book, Montaigne questions what he and his fellow Frenchmen know in the light of contemporary accounts of cannibalism in the New World. The Gordon Collection includes the published travel narratives of Jean de Léry and André Thevet that both include firsthand accounts of the New World cannibalism that inspired Montaigne’s essay.